On 22 November 2007, we opened our first show: in a shadow – an evening of performance poetry. The performance was the fruition of a conversation between the two founding members, who at the time, were performers searching for ways of approaching theatre as a practice that would be contemporary, politically-engaged and exploratory. Performance would continue to be an evolving exploration within the company, and from the first performance emerged as a philosophy the intention to explore the possibilities and perceived limits of the theatre – while always referencing the form and discipline of the theatre that had shaped the formation of the company. Over the years this conversation has become deeper, extending beyond its two founding members to include, and be shaped by members who would be a part of the Floating Space core group, casts of actors, collaborating artists, production teams, students, funders, mentors and audiences who have followed and supported our work. They have become firm friends of Floating Space. And we feel, an integral part of the marking of our ten-year journey. While we look to an exciting, and unknown future of making and sharing work – we are committed to a retrospective glance at a body of work that Floating Space has produced. The recently concluded period of residence at Cornell University, undertaken by our founding members, feeds into this intention of reflection and reflexivity as we move forward in our evolving sense of performance and practice. 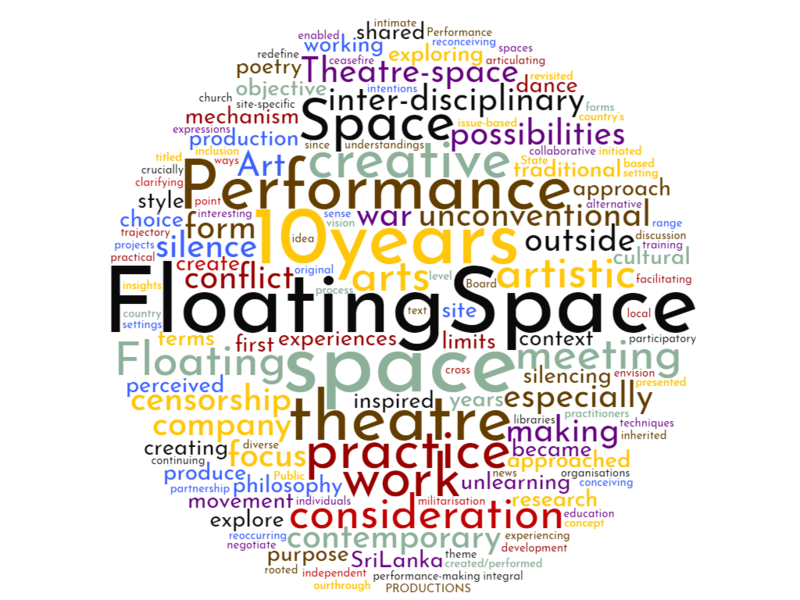 Floating Space, initiated in 2007 by Jake Oorloff and Ruhanie Perera is a contemporary performance company based in Colombo, Sri Lanka. Created as an independent inter-disciplinary artistic, teaching and research context to explore possibilities and question perceived limits in performance, our work has engaged with, as well as confronted the theatre as concept, making and site. Floating Space is inspired by unlearning, the unconventional and shared experiences in performance. Its focus is to create and produce performance, with the objective of exploring the possibilities of theatre in terms of form, style, space approach and purpose.